Wily Trout is the wine label of Poacher’s Pantry. The fruit is all estate grown and nurtured with feeling and talent. The wine making is managed by William Bruce who oversees the efforts and travails of the wine making team. Poacher’s Pantry is only a short drive from Canberra, a few minutes west of Hall nestled in the hills north of the Barton Hwy., where the wide open spaces give way to gentle hills and well managed land. 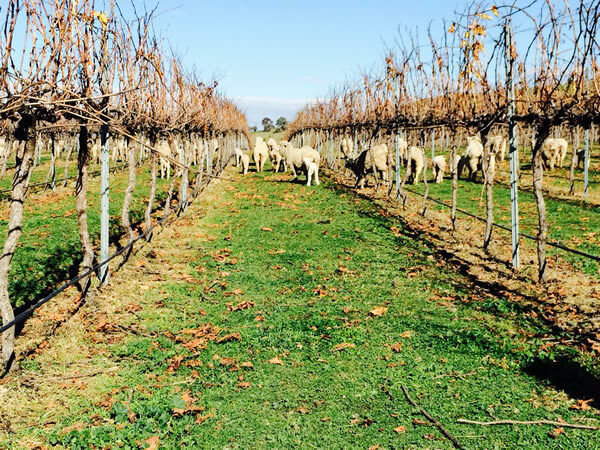 Sheep graze amongst the vines, the road meanders on to the restaurant and tasting room, very welcoming. Spend some time, enjoy the whole experience, quality food, produce and wine. There are currently 7 wines available for tasting. A couple of sparklings, two whites and three reds. Here are my tasting notes relating to a few. Gentle unmistakeable tropical fruit nose with waft of honey. The taste is true to aroma, up front firm and complex tropical fruit, with a hint of comforting herbal sweetness, in the back middle palate distinct minerality, continuing to a good dry but not harsh finish. In short a complex wine of good length with some unexpected but pleasant twists and turns. 100% sparkling Pinot Noir with 18 months on lees. After enjoying the wonderful sound of the bottle opening, enjoy the bubbles and the smell of rich red fruit with a hint of confectionary and fruit cake. In the mouth the wine is round and creamy, the flavours are strawberry and dairy, the bead is fine and persistent, the finish dry and pleasing. Celebrate! Selected from the best barrels from the 2010 vintage and bottle matured before release. Very bright middle to dark fruit nose with that something extra, tantalising like a rose beginning to bloom. The oak treatment is very skilful and ensures good balance for the bright fruit at the front of the mouth and supports the wine throughout allowing the tannins to give that added complexity, completing a wine of flavour, length and interest.